Background The mammalian kidney develops through reciprocal inductive signals between the metanephric mesenchyme and ureteric bud. Transcription factor 21 (Tcf21) is highly expressed in the metanephric mesenchyme, including Six2-expressing cap mesenchyme and Foxd1-expressing stromal mesenchyme. Tcf21 knockout mice die in the perinatal period from severe renal hypodysplasia. In humans, Tcf21 mRNA levels are reduced in renal tissue from human fetuses with renal dysplasia. The molecular mechanisms underlying these renal defects are not yet known. Methods Using a variety of techniques to assess kidney development and gene expression, we compared the phenotypes of wild-type mice, mice with germline deletion of the Tcf21 gene, mice with stromal mesenchyme–specific Tcf21 deletion, and mice with cap mesenchyme–specific Tcf21 deletion. Results Germline deletion of Tcf21 leads to impaired ureteric bud branching and is accompanied by downregulated expression of Gdnf-Ret-Wnt11, a key pathway required for branching morphogenesis. Selective removal of Tcf21 from the renal stroma is also associated with attenuation of the Gdnf signaling axis and leads to a defect in ureteric bud branching, a paucity of collecting ducts, and a defect in urine concentration capacity. 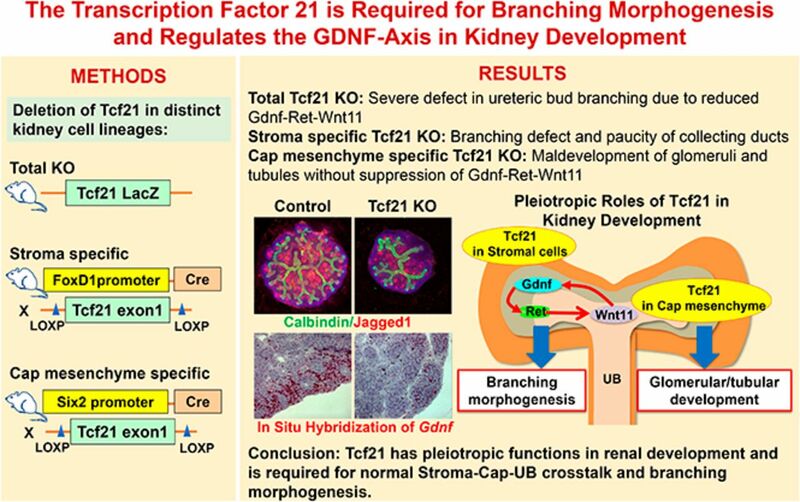 In contrast, deletion of Tcf21 from the cap mesenchyme leads to abnormal glomerulogenesis and massive proteinuria, but no downregulation of Gdnf-Ret-Wnt11 or obvious defect in branching. Conclusions Our findings indicate that Tcf21 has distinct roles in the cap mesenchyme and stromal mesenchyme compartments during kidney development and suggest that Tcf21 regulates key molecular pathways required for branching morphogenesis.